WASHINGTON—African music is catching hold in the United States. The recent arrest of Fela in Lagos on the eve of his scheduled U.S. tour has captured considerable attention here just as the Kingston shooting of Bob Marley did in 1976 in a newly reggae conscious America. National tours in 1984 by Sonny Okosuns, Tabu Ley and Mbila Bel, Egypt 80 (minus Fela), Sunny Ade, and east coast appearances by Franco and O.K. Jazz have helped to spread the gospel, African style. Chief purveyors of popular music at the time were Salia Koroma, the noted Mende accordionist; Ebenezer Calender, playing the maringa style (not to be confused with the merengue of Dr. Nico); S.E. Rogers and his Morningstars; Sami Kamara and the Black Diamonds; the Ticklers; and the Heartbeats featuring the famous Dr. Dynamite. Also of considerable note were the milo musicians, varied ensembles of street players parading up and down with their homemade instruments, beating out incredible rhythms, and drawing crowds wherever they went. To make sure they always had the latest records to spin, Ibrahim and his friends would listen to a radio record request program from Brazzaville. When they heard numbers they wanted, they would head for Adenuga’s record shop on Goderich Street or the ABC record shop farther out in eastern Freetown. He wrote letters and made countless phone calls to London, Paris, and Abidjan but soon learned that the African record business was more complex than he had anticipated. Gradually, through trial and error, he developed the right contacts and began importing records. Operating on a small scale from his apartment, under the name Sahara, he sold to friends and began to build his business through word of mouth. 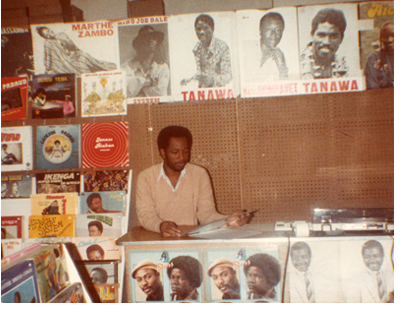 Scarcely more than a year later, he had saved enough money to rent a shop and in November of 1981, the African Music Gallery opened for business. It hasn’t always been smooth sailing but Bah now feels comfortable with the record business. “I’ve overcome that panic. Now what I’m working at is trying to establish the music here, trying to have it accepted and also getting into production.” First productions for the African Music Gallery label will be the albums Manuela and Samedi Soir by Bopol Mansiamina the popular young bassist from Zaire. Previously available only as imports, these two albums mark the beginning of a planned series of U.S. releases for 1985. Bah eventually hopes to attract African musicians to America to do the actual recording of their music. By pressing records here, instead of importing them, he hopes to be able to reduce prices and thereby make the records more marketable. Another aspect of marketing the music is Bah’s involvement in promoting live concerts by African bands. He successfully arranged Franco’s 1984 appearances in New York and Washington and hopes to bring Les Quatre Etoiles (Bopol, Nyboma, Syran, and Wuta Mayi) over for a national tour in April or May with Afro National to follow sometime later. Concert promotion, like the rest of the music business, is not without its pitfalls. Bah tells the story of his recent experience with Franco and O.K. Jazz. “I spoke with Franco several times and we had agreed we were going to have twenty-five people in the group...and I applied for the visas and got the visas. A week or so later he got pressure from his quarters that some people must be in the band, and he called me and said, ‘Look Ibrahim, I cannot come with just twenty-five, I’ve got to come with forty-five people.’ I said, ‘You mean forty-five, four, five?’ He said, ‘Yes, forty-five.’...He gave me the additional names, and I applied [for visas] for the rest of their names. And immigration said, ‘Hey, one moment this group is twenty-five, the next minute they’re forty-five; what kind of group is this?’” In the end, the visas were issued and the tour went ahead, but Bah was somewhat chastened by the affair.